This time last year I abandoned an attempt to ride around the coast of Ireland - I had called the trip "The 100 Corners of Ireland". I set out from Dublin in a southerly direction making it all the way around Wicklow, Wexford, Waterford, Cork, Kerry, Clare, Galway, Mayo, and to Sligo. The rain got the better of me and I gave up in Sligo town, returning to Dublin. Today I have had the chance to continue in much better weather and returned to Sligo to continue the trip around Leitrim and Donegal, finishing in Derry. I don't plan to complete the trip around Northern Ireland - perhaps next summer. 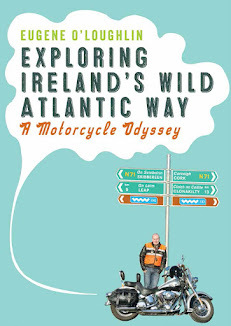 I am following the proposed Wild Atlantic Way (WAW) and stopping off at the points of interest suggested by Failte Ireland. I plan to deviate from the route as I see fit, following signs to any place that sounds interesting. First port of call was Rosses Point after which I stopped at Drumcliff to see the grave of W.B. Yeats. The WAW has a lot of beaches as so-called "points of interest" and I certainly saw my fair share of these today. I stopped at Streedagh Point, Mullaghmore, Tullan Strand (in Bundoran), Rossnowlagh, and Murvagh. In Ballyshannon I stopped at a statue to Rory Gallagher who was born and raised there. A man, calling himself "The Fiddler", introduced himself to me as one of the three men who placed the statue in its position. Donegal was my initial destination for the day, but after stopping in the Tourist Information Centre, which by-the-way is staffed by the most helpful people in Ireland, I decided to continue on the Killybegs where I am as I write this post. I am in the Tara Hotel overlooking the harbour, below is my view which includes a Dutch Tall Ship. I have booked into the Seawinds B&B in the town centre - small, but very comfortable. Tomorrow it's on to northern Donegal - I don't know how far I'll get, but that's part of the experience of what I am doing. Some time tomorrow around 6.00 o'clock I will start my search for another B&B. THere are some spectacular sights ahead of me!